Whether you decide to repaint your Chevy yourself, have it done by a professional, or are buying a new car, you need to know about the different types of car paints involved in the process. The world of Chevy service can be complicated, and car paint is no different. Understanding each one will let you make a more informed decision, and find a type of car paint that’s right for your vehicle. There’s an undercoat finish (paint primer) that’s typically put down first. After that, you’ll get to choose between a base coat, acrylic lacquer, clear coat finish, or some of the specialty paints available. Since the primer is the first layer to ever be put on the vehicle, it makes sense to start by discussing that. Base coats and clear coats are also more common than acrylic lacquers or specialty paints, so this list is (loosely) presented in the order of common to rare. With a prep or undercoat finish — a.k.a. the primer — expect shades of grey or black. Just like when painting the walls of a house or other wood-based product, the primer is used to get the surface of the vehicle ready for painting. How? Because, primers (in general) are put on in order to help the surface of the paint stick to the vehicle. Trying to throw a base or clear coat on a metal surface without the primer would not only look shoddy, but the paint wouldn’t bond consistently. As a result, you could see flaking and chipping. Therefore, you can think of the primer as the binding layer. Spray paint primers are also available, and keep moisture away from the bare metal surface. If you paint on moisture, then you run the risk of causing oxidation or rust. For those DIY fanatics, you should know that the primer is often porous. Meaning you’ll need to sand it down to create a flat surface. If not, the next layer of paint could look bumpy, and potentially not adhere properly. Base coat paints are just like the name implies — basic. It’s the actual colored paint of the vehicle that would go on top of the primer layer. Now, here’s the important part: base coats don’t contain any strengtheners or hardeners. This means it’s just raw paint, sitting on top of the primer. It won’t protect itself — or the primer layer and metal frame — very well. If left in this raw state, you will likely see noticeable blemishes in the paint, which potentially let moisture in, rusting the surface of the frame. Since that’s the case, base coats are often used with a clear coat or a urethane base coat. This protects the paint, primer, and frame from the elements much more effectively and also allows it to shine a little more thanks to the glossy nature of the clear coat. 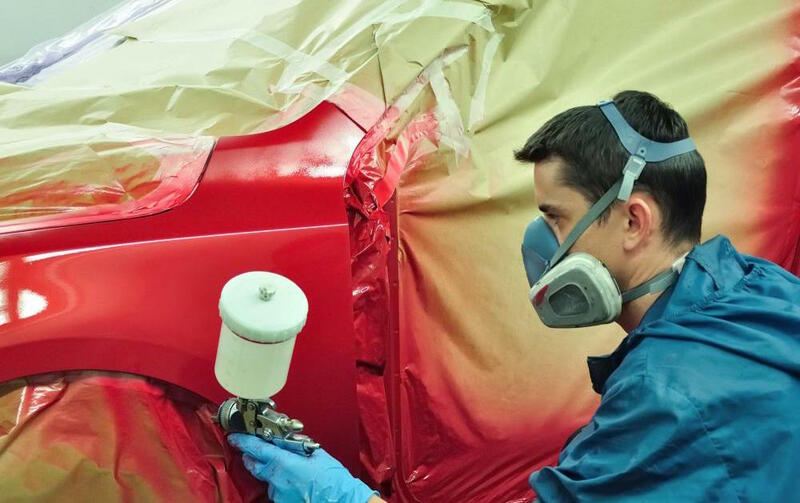 Using a base coat and a clear coat is perhaps the most common way to paint a car, seeing as using two coats of paint provides shine and protection. Often referred to as a clear coat finish — because of its placement on top of the base coat — is actually a paint that doesn’t contain any color or pigment. Weird, right? Yes and no. The point of clear coat isn’t to add color. It’s to protect the paint that’s underneath and make it shine, like we just learned above. Which is why in most cases, clear coat finishes have specialized chemicals that provide easy adherence to the flexible components, like a plastic bumper. One of the biggest ways paint gets damaged results from oxidation courtesy of the sun’s UV rays. This is why the clear coat finishes have UV inhibitors in them. These help prevent the ultraviolet rays from fading the color of the vehicle. Often, these finishes are made from urethane or polyurethane. This is what helps the vehicle get that high-gloss showroom sheen that you see on new cars. With proper care, this shine can be maintained for years to come. Now, we get into the rarer types of paint. Acrylic lacquers have been discontinued by many manufacturers, simply because they are now considered outdated. Base coats with a clear finish on top provide a better shine with better protection. That said, if you are looking to restore a model that might be considered antique (or are considering buying one), you’ll want to pay close attention to this section. Acrylic lacquers are used on classic or antique cars, because these vehicles aren’t used as daily drivers. This is the same reason you find acrylic lacquers on showroom vehicles. This is a paint that undisputedly provides the most glaring shine on a vehicle. But, this sunglass-inspiring shine comes at a price: it doesn’t provide nearly as much protection as a clear coat finish would and so should only be used on limited use cars. If you used this as a daily driver, you’d end up paying dearly trying to keep the finish showroom-shiny. More often than not, these lacquers are mixed with a thinner to make them easier to spray because, on its own, lacquer is typically a thick, glue-like substance. Perhaps not as rare as acrylic lacquers — but certainly not any more common than clear coats — you have plenty of specialty paints available. One example is the acrylic name paint found on older cars. Some owners prefer this, and it’s called a one-stage paint. Why? Because unlike modern day paint jobs that involve layering different paints together, acrylic enamel is applied in one shot. It only requires a single application, with no base coat or even clear coat finish. Believe it or not, metallic finish paints are also considered a specialty type paint. These are typically the paints you can expect to find on performance-oriented cars because it provides a more jazzed-up version of a base paint color. Chameleon paints are much more elusive, and rarer than metallic finish paints. These are the types of paints that provide an illusion of changing colors, or even sparkling. I’m sure you’ve seen that one car that goes from what seems to be a gray-to-purple color, depending on the angle it’s viewed. If you’re thinking about finding a car with one of the speciality paints, or restoring an old one with acrylic lacquer, do some more research before you make that choice. They’re slightly more complicated than the primer, base paint, and clear coat finishes – currently the most common method and the one that provides the best protection when those layers are collectively applied.